दिसम्बर डिलीवरी के लिए अनुबंध 3,582.00 रुपये के पिछले बंद से 1.65% नीचे या 59.00 रुपये द्वारा 3523.00 रुपये पर कारोबार कर रहा था। अनुबंध के लिए ओपन इंटरेस्ट 204,390 लौट्स पर खड़ा था. 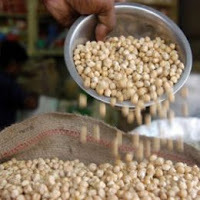 Chana futures have plunged with the start of the new week, the start of winter session of Parliament this week, it is likely that issues of Govt steps to control rising inflation will be raised and this is putting adverse impact on the prices for the commodity. The contract for December delivery was trading at Rs 3523.00, down by 1.65% or Rs 59.00 from its previous closing of Rs 3,582.00. The open interest of the contract stood at 204390 lots.